Komodo Scuba can provide a 5 day/5 night liveaboard, diving the best dive sites around Banta and Komodo. Each trip will depart on Monday at 12 midday from Labuan Bajo, Flores and will return to Labuan Bajo around 3pm on the following Saturday. Our trips take only 5 guests. Yes, you read that right! only 5 guests. With our emphasis on advanced dive sites, bigger fish and the currents that make this area so desirable…there is no other boat like it! The trip will consist of 14 dives: 1 dive on the first and last days and 3 dives per day in between. Please contact us to book this trip!!! This Komodo Scuba liveaboard is unique in that we only take 5 guests per trip. With such a small group and such great diving – this makes for an incredible liveaboard safari to these amazing dive sites. 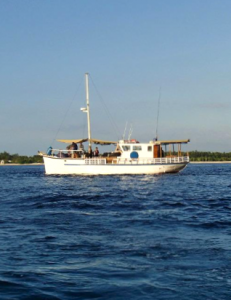 As Komodo is such a diverse area for diving and the currents can be quite extensive…it is very important to go with experienced dive guides and on good boats. Our Advanced Komodo Liveaboard offers both! All guests get to use our Lifeline safety equipment – featuring GPS units and radios in case of accidents or drifts. With such an intimate boat we also create an atmosphere that builds friendships and makes for a far more intimate experience that on the massive boats. Our schedule is applicable until October 2012. She is an 14.5m ex Australian Cargo Boat, built in Tasmania, Australia and made to endure the harshest seas of the Great Australian Bight. 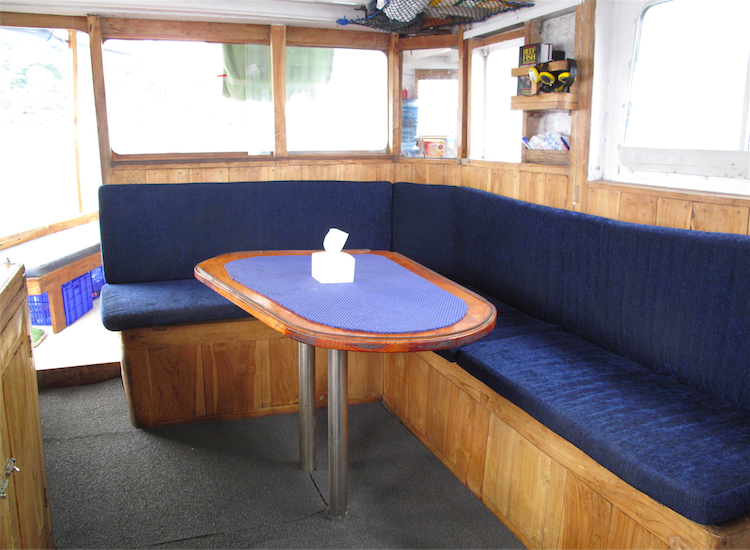 Our Komodo liveaboard can sleep 4 guests across 2 cabins, 1 en-suite and 1 shared bathroom. The dive deck onboard has 2 tanks per diver so we can aim to fill the spare tanks while diving so the boat can remain as quiet as possible between dives and over night. We enter the dive sites through an opening in the side of the dive deck so we can make mostly giant stride entries directly from the boat without making too many lengthy dingy rides in the heat of the Komodo National Park. However, we also understand the importance of surface support so we have a 4m inflatable dingy for pick ups after every dive, and drop offs during the event of rough sea conditions.